Brides Bouquet: Soft natural stem posy consisting of large Peony Roses, open garden Roses, Babies breath and foliage. Colours pastel pinks, cream and whites. Stems bound with Hessian and lace. Bridesmaids Bouquets: Soft natural stem posy consisting of large Peony Roses, open garden Roses, Babies breath and foliage. Colours pastel pinks, cream and whites. Stems bound with Hessian and lace. 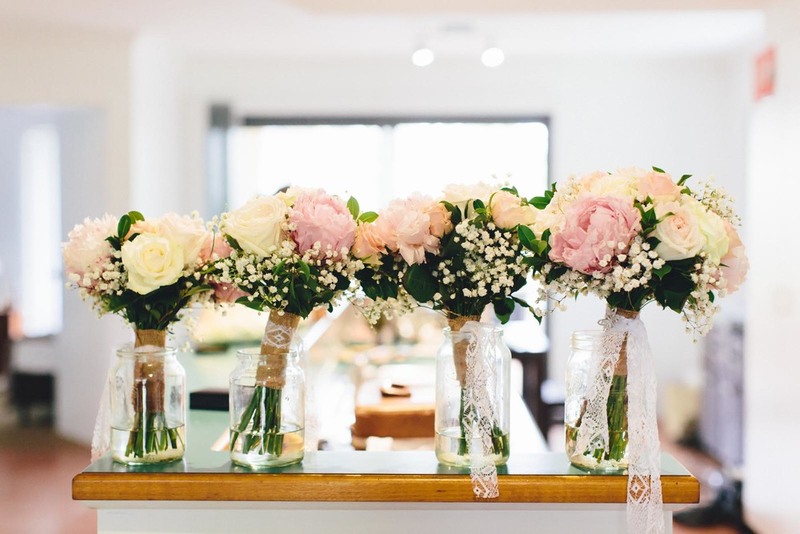 Arbour: Mixed glass jars filled with a selection of pastel blooms hanging by arbour with ribbon, lace and twine.